Hebrew poet of the twelfth century; possibly a grandson of Isaac Gḥayyat, the famous teacher of Lucena. Solomon was on terms of friendship with Judah ha-Levi, who dedicated to him one of the most important compositions of his "Diwan" (ed. Brody, i., No. 94). 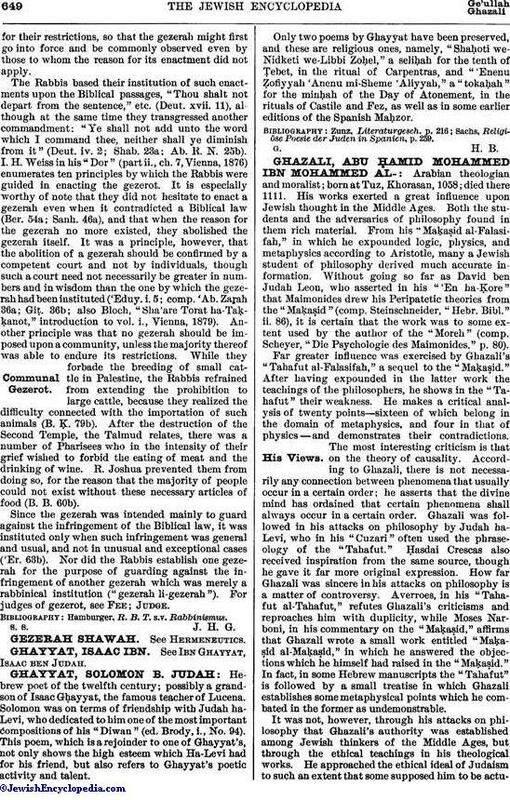 This poem, which is a rejoinder to one of Ghayyat's, not only shows the high esteem which Ha-Levi had for his friend, but also refers to Ghayyat's poetic activity and talent. Only two poems by Ghayyat have been preserved, and these are religious ones, namely, "Shaḥoti we-Nidketi we-Libbi Zoḥel," a seliḥah for the tenth of Ṭebet, in the ritual of Carpentras, and "'Enenu Ẓofiyyah 'Anenu mi-Sheme 'Aliyyab," a "tokaḥah" for the minḥah of the Day of Atonement, in the rituals of Castile and Fez, as well as in some earlier editions of the Spanish Maḥzor. Sachs, Religiöse Poesie der Juden in Spanien, p. 259.